Commandos: beyond the call of duty, a stand-alone expansion to Behind Enemy Lines , ends up feeling like a shadow of its former self , being both shorter and more frustrating than the original. Quake II is a year old game, but the new weapons and power-ups make the game interesting again. CenterNET had been holding tournaments for this game for the past six months. Quake III Tournament - Coming soon!!! "We're giving t-shirt to the winners in different tournaments.PLUS! a trip to hongkong." Delta Force is a special forces combat against terrorist and insurgent forces.You can play the game from either a first- or a third-person view point.You can even do both at the same time, thanks for the picture-in-picture feature that lets u see your first person view in a small window while playing the game from third person POV. 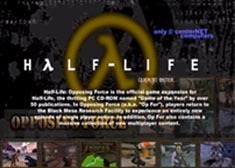 Half-Life: Opposing Force is the official game expansion for Half-Life, the thrilling PC CD-ROM named "Game of the Year" by over 50 publications. 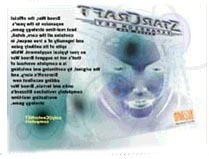 In Opposing Force (a.k.a. "OpFor"), players return to the Black Mesa Research Facility to experience an intirely new episode of single player action. In addition,Op For also contains a massive collection of the new player content. Brood War, the official expansion to the year's best real-time strategy game, contains all the care, detail, and ingenuinity of a true sequel, inspite of its unlikely guise as your typical supplement. 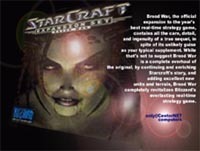 While that's not to suggest Brood War is a complete overhaul of the original, by continuing and enriching Starcraft's story and adding excellent new units and terrain, Brood War completely revitalizes Blizzard's everlasting real-time strategy game. @CenterNet "WE OFFER YOU, THE BEST OF THE BEST GAMES EVER!"